Abstract: What's particularly interesting about the Reeven Ouranos heatsink is not the number of heatpipes or the fact that it's yet another 'tower heatsink'... but that Reeven's thermal engineers have decided to use a combination of 8mm and 6mm diameter heatpipes in concert. On the test bench today is Reeven's Ouranos RC-1401 heatsink, a 160mm tall tower cooler that uses half a dozen heatpipes to conduct heat energy away from a solid copper heatspreader to a large aluminum cooling fin stack. The heatsink ships with a 140mm PWM fan whose orange impeller spins at 1700-300RPM. Two 8mm heatpipes are positioned at the center of the Ouranos' heatspreader, while four 6mm heatpipe cover the outside edges. The thinking is that multi-core processors have higher heat fluxes in certain regions of the silicon die and coupled with the CPU IHS and RC-1401's heatspreader, the central strip of the cooler is going to receive the most heat per unit of area.... so larger diameter (more heat transfer capacity) heatpipes would be more efficient there. However, heatpipe density decreases with heatpipe diameter, so the outer areas of the heat spreader are still packed with typical 6mm diameter heat pipes. In any case that's the idea, we'll see how the Reeven Ouranos RC-1401 heatsink actually performs in a moment. Reeven's Ouranos heatsink weighs in at 1030 grams and accommodates Intel socket LGA2011-3/2011/1366/115x/775 processors and the full range of AMD socket AM2/AM3/FM1/FM2 CPUs. Extra wire fan brackets are supplied for users to add a rear exhaust fan, which is a nice bonus. 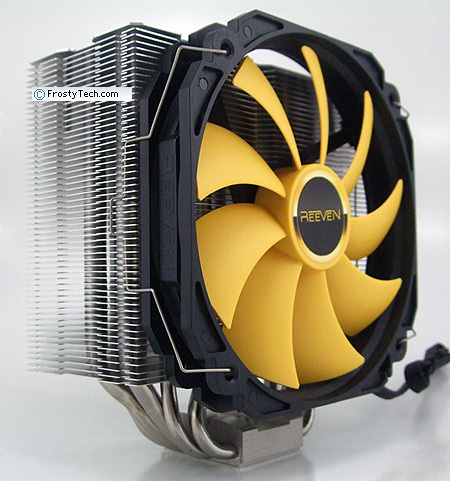 The Reeven Ouranos RC-1401 heatsink retails for around $55USD. In the image below you can plainly see that Reeven's thermal engineers have designed the Ouranos RC-1401 heatsink with a combination of two different heatpipe diameters. 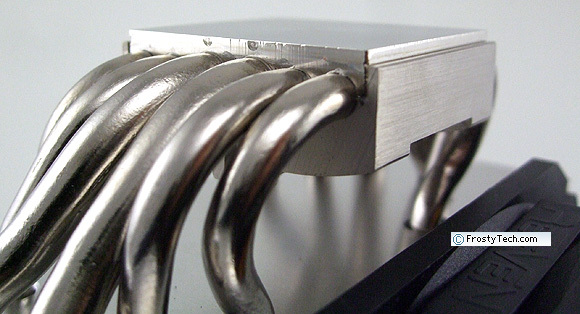 The four 6mm diameter and two 8mm diameter heatpipes intersect the aluminum cooling fins at spacings ranging from 50mm on center to ~110mm on center. Also notice how the body of the Reeven Ouranos heatsink is asymmetrically located over the heatspreader (ie. CPU). The leading edge of the aluminum fins are in fact flush to the copper base plate while the trailing edges extend ~20mm beyond it. 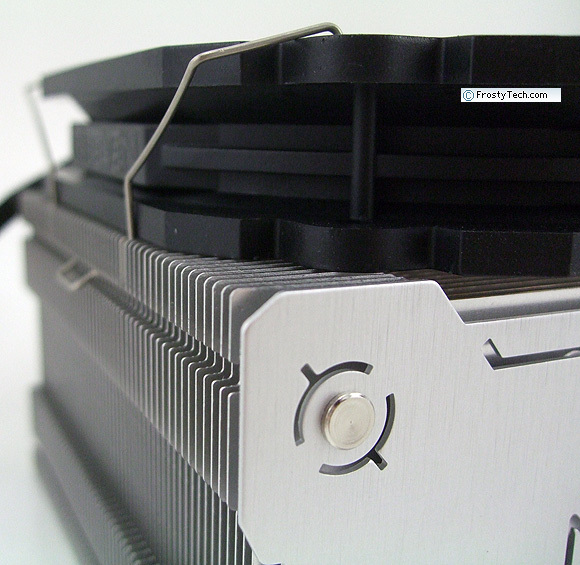 The heatspreader on the bottom of the Ouranos heatsink varies from 3-6mm thick and appears to be soldered to the heatpipes. The Reeven Ouranos RC-1401 heatsink uses a set of springy wire fan clips to directly hold the 140mm fan against the aluminum fins. There are no rubber pads or strips to prevent vibrations from developing down the road. Extra brackets are supplied so a rear mounted exhaust fan can be installed (2nd fan not included) if the user wishes to run the Ouranos with a pair of slow turning fans for the sake of noise reduction. 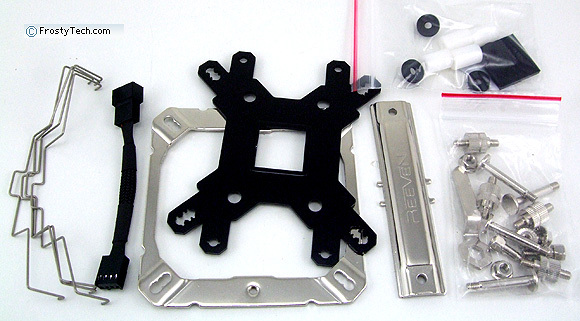 The Reeven Ouranos RC-1401 heatsink is compatible with Intel socket LGA2011-3/2011/1366/115x/775 and AMD socket AM2/AM3/FM1/FM2 processors and ships with a pair of metal brackets that attach to the motherboard to securely hold the 1030gram heatsink in place. 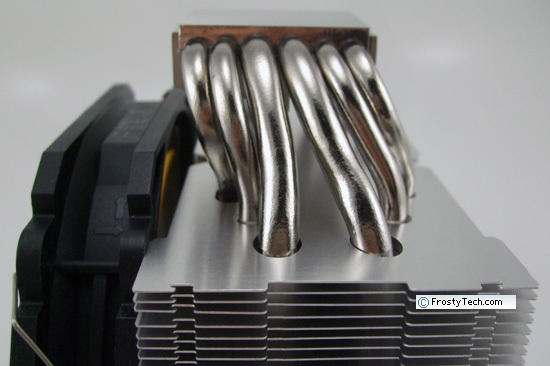 As a metal plate needs to be installed at the back of the motherboard to prevent clamping forces from distorting the PCB, be prepared to pull off case side panels when installing this heatsink. Clamping forces are applied by a fulcrum plate, which in theory applies mounting pressure more evenly than four-point screw-tensioned systems. Beyond the hardware, we find a small pack of grey thermal grease, fan speed reducer and extra set of fan brackets included.